calling to his family, somewhere. I have seen no other geese. you are forever beyond hearing. or sleep by my side. Mary Oliver, who passed away this January, remains one of this country’s most popular poets. She won both the National Book Award for Poetry and the Pulitzer Prize for Poetry. On a more personal level, I feel a connection to her work because she was born in northeast Ohio, near where I live. Oliver frequently uses themes of nature in her work, so it is not really a surprise that she has an entire book of poems about dogs. Published in 2013, Dog Songs contains many poems about canines in general as well as some specific dogs in Oliver’s life. There are also beautiful sketches of dogs throughout the book. Her simple, unadorned structures and word choice fit the topic very well. You can easily see her familiarity with and love for dogs coming through. From the very first poem I could see how she uses the motif of dogs to discuss issues of identity, love, living well, and even what it means to be human. or wait for me, or be somewhere. Now she is buried under the pines. Specifically, it’s that “be somewhere” that got me. It seems to me that the essence of grief is distilled into those two little words. Jolee, my cat, used to be somewhere. He existed. And now he is not, does not. As simple as that. If you are not familiar with Oliver’s work, now is a great time to check it out since April is National Poetry Month. Let me know which poem of hers is your favorite! y eso es el dolor. To my knowledge, this is the only poem I’ve ever written in Spanish. (Corrections are appreciated haha). Last time, I talked about my study abroad semester in Salamanca, Spain; I also wrote this poem at that time. I liked the irony that I was using Spanish to express my frustration at being in a place that speaks Spanish. I left it crumpled on the bed. and it’s 67 days ‘til home. Te echo de menos, but you wouldn’t understand. but I feel I’m wearing thin. and dreaming of your smooth skin. and it’s 38 days ‘til home. 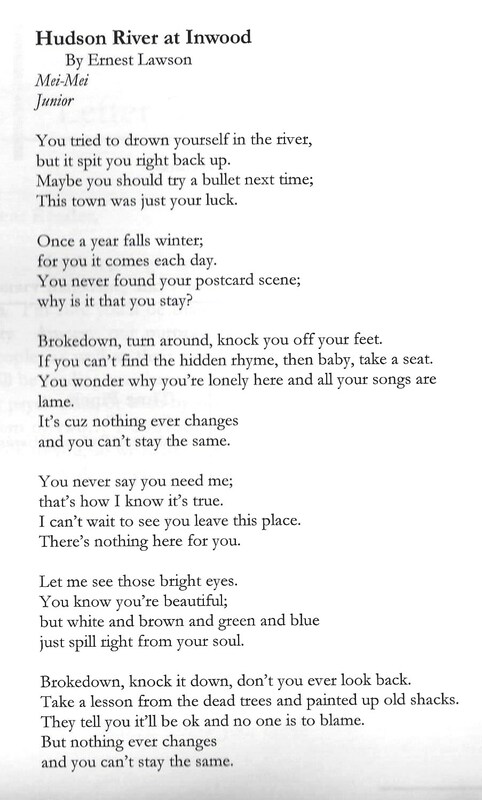 I couldn’t find my printed copy of this poem, but it was published in Confiscated, my college literary magazine, in 2007. I wrote it in fall 2006 when I spent a semester abroad in Spain, mainly in Salamanca. It was a wonderful experience, but I missed my boyfriend (now husband) a lot. I was feeling quite lonely in a hotel room in Santander (with ugly decor in harvest gold…) and started writing this about it. It’s actually a song, as most of my poems are. I was listening to Fall Out Boy’s album From Under the Cork Tree on repeat at the time (“songs about hips and hearts”), and not only did it get me through that semester emotionally, it inspired me to start writing songs again. When I submitted this to my lit mag, even though I removed my real name, one of the other editors immediately knew it was mine and picked up the FOB reference. Te echo de menos obviously means I miss you in Spanish. My husband does not speak any Spanish haha. This piece was written for a class on poetry writing, and it’s the only thing I wrote for that class that I actually like. As an exercise in ekphrastic poetry, we were given postcards with works of art on them to inspire us; I can’t find the exact one I had, but mine looked very similar to the top image. Artist Ernest Lawson did many paintings of the area around Inwood. I wrote this piece almost all at once very quickly, while sitting in the music building on campus. I might have been waiting for a flute lesson or rehearsal. It’s actually a song, which is true of many of my poems. I had been struggling in the poetry class for a while (I found the prof pretentious, and all the other students were lit majors), but once I started writing it as a song, this one just seemed to click for me. When I met with the prof to revise this poem (which was the only thing I wrote that he remotely liked, either), he made some suggestions and I dutifully made corrections and handed it in. Then I published the original in the literary magazine, because the corrections ruined the rhythm of the song. I ended up with a B in the class, which hurt my GPA. It’s the only college course I regret taking. I honestly haven’t written much poetry since. If I were to publish this again today, I’d rearrange some of the stanzas, swapping the 2nd halves of the choruses so it ends with “You wonder why you’re lonely here…” instead of “They tell you…” and also swapping the second verse stanzas so “Let me see those bright eyes” comes first.